Marketing 101 – you really shouldn’t ignore your blog. Yet I’ve done just that. I will try to be better. It really is a commitment, though, isn’t it, hard to fit in around a full-time job and a personal life? I’ve still been cooking on a regular basis (I guess one has to if one doesn’t want to starve), I just haven’t been writing about it. I have deviated from family recipe making again (just for the time being), and have been busy making recipes I’ve either thrown together myself or have found on the Internet, or more specifically, on Pinterest. I’m proof that sometimes people actually make the recipes they pin (and you thought it was just an urban legend)! Most recently, I made these “Cruncher Bars”, for which the full recipe can be found here www.twirlandtaste.com/2011/01/crunchers-addictive-chocolate-brown.html. Oh, are they yummy—I’m having a hard time sharing these—I want to eat them all myself. In my defense, I only had enough ingredients to make a half recipe—does that make me sound less like Miss Piggy? The next big family recipe I bought all the ingredients for and that I plan to tackle is something my maternal grandma and mom made every year called fruit soup. It’s a little putzy, which is why I haven’t tackled it yet (other than to buy the ingredients for it). Until I do that, in my next few blog entries, I will share some of the photos of items I have been making over the last month and a half. In the meantime, one of the things that has kept me busy is that I have been scanning old family photos onto my laptop, so that both my brother and I will have digital copies of all of our parents’ photos. 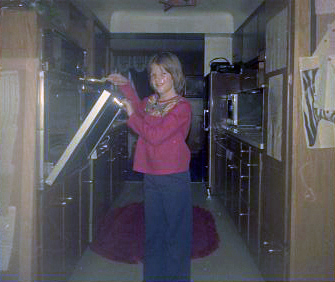 Actually, I’ve been scanning in all my parents’ film negatives, to be more exact. And because I don’t have a lightbox to see what is on the negatives, I either let what is on them be a surprise and don’t know what is on each film strip until after I’ve scanned it into my computer, or, I try to get an idea of what is on the film by using the flashlight feature on my iPhone and holding the negative over my iPhone’s screen. That, at least, gives me a rough idea before I hit scan of if I am going to get an image of a person or a tree, for instance. It’s a fun surprise, most of the time though, to see the detail of the photo emerge, once the negative has been scanned in. 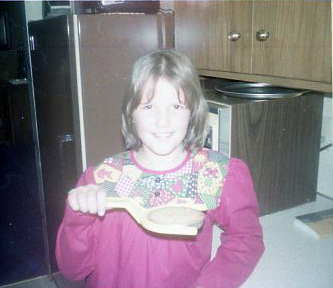 I was delighted to run across several of these family food-related photos, as I’ve been scanning, that I thought I would share. 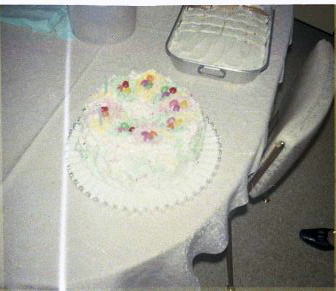 Since my late March birthday would fall close to Easter some years, my paternal Grandma Mabel often made me an Easter-themed birthday cake. This one has little pastel-colored coconut nests with jelly bean eggs on top. 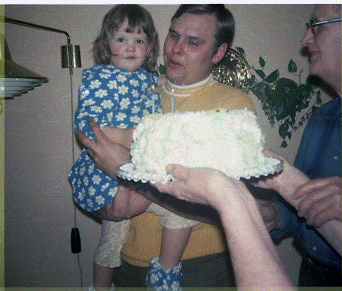 That’s me (looking feverish and like I am just getting over the flu) in the blue robe, being held by my dad, while my Grandpa Claus looks on as Grandma presents me with my cake. Isn’t the cake fabulous? I just love it! 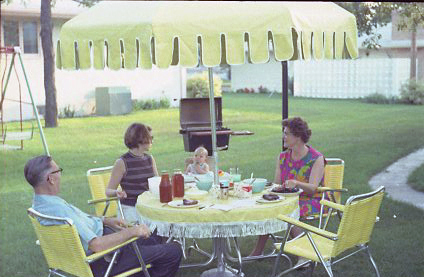 This photo is charming for so many reasons–the backyard patio picnic by the grill and swing set–what a slice of Americana. 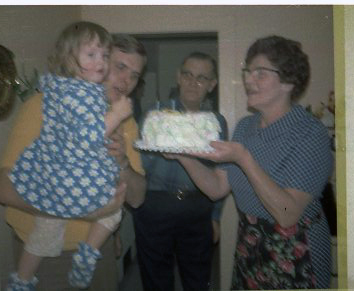 From the left is my Grandpa Claus, my mom, me, and my Grandma Mabel. Isn’t Grandma Mabel’s dress fabulous? She made all her own clothes. I just love how colorfully vibrant and mod that dress is. 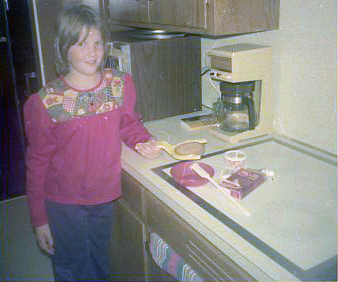 For some reason, I never got an Easy Bake Oven for Christmas, even though I swear I asked for one every year until I was something like 18-years-old! However, for some other odd reason, I was allowed to buy the miniature cakes, cookies, and brownies that were designed to be baked in the Easy Bake oven. I just had to bake them in the regular oven. I still remember thinking those tiny little desserts were delectably good. Hopefully my palate has become a bit more refined since those days. 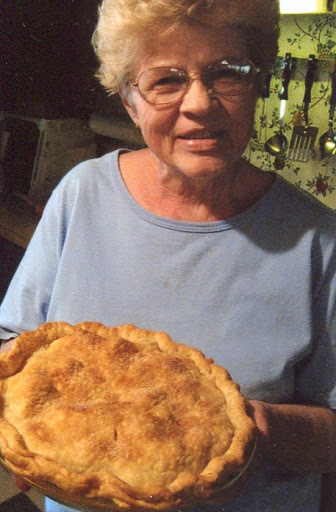 Here is my beautiful mom, Beata, holding one of the apple pies I had just made. One year, the apple tree my parents had planted on their property really went into hyper-drive and produced a lot of apples. I must have made an apple pie every weekend for eight weeks straight that year. It was a recipe from a Taste of Home cookbook that is packed away in my storage unit at the moment, but some day, I will find it again and share it. I don’t know if it was the recipe or the hand-picked apples, though, that made it so good. This entry was posted in cruncher bars, dessert, old family photos, pinterest and tagged cruncher bars, dessert, old family photos, pinterest. Bookmark the permalink.